Navy Sequin Top Evening Dreas Size 22. Really lovely evening gown only worn once. Navy and silver sequinned top with navy skirt this was really long when I bought it so did cut a couple of inches off the bottom of the net and skirt and took up the underskirt. really hard to do so not completely even but not noticeable when wearing. Measurements in case you want to check length are front from bottom of v neck to hem .... 127cm. Too of back zip to hem 150cm. Condition is Used. Dispatched with Royal Mail 1st Class. 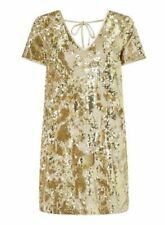 ladies sequin dress size 16 George New. Condition is New with tags. Dispatched with Royal Mail Signed For® 2nd Class. The item that you are looking at is a gorgeous NEXT white sequin covered short sleeved v neck dress. Sized 14 - the shoulder to hem length is apx 35" and it's made from polyester - with the black and white rib being made from viscose and nylon. CHARLIE`S BLACK SEQUIN BUNNY T-SHIRTMINI DRESS. SILVER SEQUIN BUNNY FRONT. SIZES TO CHOOSE FROM 8-10-12 OR 14. CHARLIE`S SEQUIN TOP YELLOW SKIRTMINI DRESS. MULTICOLOUR SEQUIN TOP. YELLOW SKIRT. ZIPPED OPEN BACK. Next Sequin Party Dress Size 22. City goddess sequin & lace plus size fishtail maxi dress in black 20. Condition is New with tags. Dispatched with Royal Mail Signed For® 2nd Class. Cross over bust and flattering empire line style. Wallis Very Chic and Unusual GOLD Sequin 1920's Gatsby Style Mini Dress. Square sequins in a lovely warm gold ( colour shows as more silver in pics but it is def GOLD) colour. This truly is a fabulous dress that shines and swings as you move. 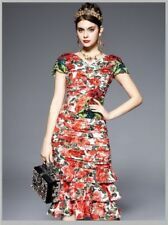 Ladies Uttam Boutique Sequin Satin Dress. Turquoise background with pink flowers sequinned and beaded. Condition is Used only twice. Excellent condition from smoke and pet free home. Dispatched with Royal Mail 2nd class signed for. NWOT MONSOON short sleeve green Sequin Tunic Shift Dress, size 16. Dispatched with eBay delivery – Shutl 2-3 days. Adorned in black sequins it’s perfect for a special event with nice heels and / or hat. Nice black stitching detail and dry cleaned ready to wear. NEXT BLACK SHORT SLEEVED LINED TUNIC DRESS. SEQUIN / BEAD DETAIL. SIZE UK 18. SHORT SLEEVES. Sold Out Online ! Great Service. Where the Item is not new, the condition will be described within the item specifics. Mini dress - I wear mine as a top with leggings. Yumi Kaftan Dress 100% Silk Midi Knee Embroidered Floral Moroccan Boho Size L RRP £55 Gorgeous dress, beautifully tailored and easy to wear. Extremely comfortable and slimming, great for holiday wear, day to evening. Lovely gorgeous stylish party dress. Little Mistress Occasion Dress Size 14. Condition is New with tags. Dispatched with Royal Mail 1st Class. Stunning Sequinned Dress size 24. Condition is Used. Dispatched with Royal Mail 2nd Class. LITTLE MISTRESS LADIES NAVY BLUE PARTY / EVENING DRESS SIZE 14. IT'S MADE FROM A LOVELY QUALITY SEQUINNED MATERIAL IN A VERY ELEGANT STYLE AND IS LINED ♥. 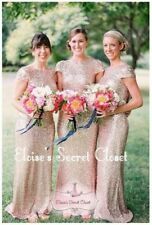 Rose Gold Sequin Bridesmaid/ Prom Dress. Dispatched with Royal Mail 2nd Class. Little Mistress Mink & Gold Sequin Maxi Dress in Size UK18 (EUR 46). Mink Chiffon Dress. Gold Sequin detail to the top part, front & back. A Fantastic Ladies Knee Length Lace Style Dress by Per Una. The dress is in a straight cut overlay style and the main body is lined. The fascia material is in a Lace style with a Silver Sequined detail throughout. Condition is Used. Very flattering on and very comfortable. Has back zip which is still in working order. I bought this dress for my stepdaughter however this is too big. boohoo sequin dress 10. Condition is New with tags has never been worn. Dispatched with Royal Mail 2nd Class. Come from pet and smoke free home. Sistaglam Maxi Dress Size 12 Bridesmaid / Occasion. Condition is New with tags. Dispatched with Royal Mail 2nd Class. Limited Edition/MARKS AND SPENCER/Size 14/PINK/ZIPPER/POCKETS. Dispatched with Royal Mail 2nd Class. Accented with eye-catching band embellished beads for twenties inspired charm, the stunning piece falls to a feminine full length fit.". Creating a subtle layered effect at the waist, it is perfect for wearing with a pair of simple heels. SEQUINNED 'ILLUSION' PROM DRESS by TIFFANYS, stunning NAVY & GOLD was £359 new. Condition is used following single wear to school Prom. A floral print dress by Oasis in size 12. Empire waist and side zip.